"I was in early morning traffic when an inattentive driver hit me from behind and I was thrown from my motorcycle." Ryan Shearman, founder and CEO of FUSAR Technologies, tells me at Augmented World Expo 2014. It's the kind of thing that could happen to any motorcyclist -- and indeed, happens too often -- but it also served as a spark of inspiration. "It started the wheels turning in my head: how can I make motorcycle riding safer?" His answer was to build a better helmet. Shearman calls his smart helmet the Guardian; it's a DOT approved brain bucket with an Android board, two wide-angle cameras and bits and pieces from an Epson Moverio. 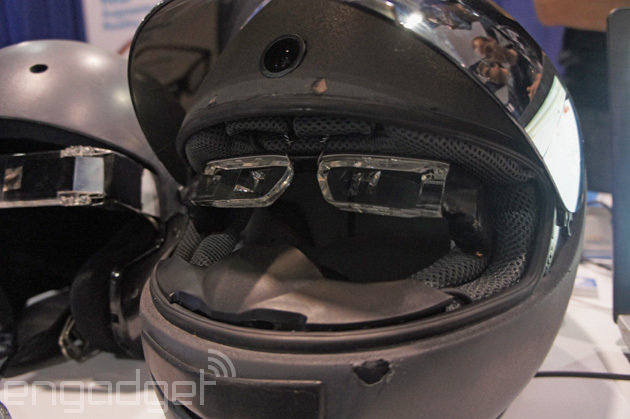 "What it is, is a fully integrated and connected device that motorcyclists can wear that allows them to have a full cognitive awareness of what's going on around them." The Epson optics provide the rider with a detailed heads-up display, filling their view with data from the rear view camera, their current speed and navigation information. "It also has video recording capabilities," he told me. "Everything is recorded passively, but in the event that an accident is detected, that footage is locked into hard memory. It effectively has a black box feature built in." It sounds like a great feature, but Shearman obviously wants it to be used as infrequently as possible. The helmet's software package is being designed to monitor the cameras for potential hazards -- if all goes well, the final product will be able to alert the driver of a dangerous situation before it becomes an accident. He also plans to add voice control to future prototypes. The models Shearman brought to AWE were pretty beat up, but with good reason: the entrepreneur has been riding up and down California's Pacific Coast Highway all week, shooting footage for his company's upcoming Kickstarter video. The company plans to launch its crowdfunding imitative by mid July, and wants to have the Guardian on the market in about a year. Hungry for a safer helmet? Check out the firm's website at the source link below.